About 20,000 Northern California utility customers don’t have electricity for a second day after Pacific Gas & Electric cut power in a pre-emptive attempt to prevent wildfires. PG&E said it expected to restore power to the affected customers on Tuesday. The utility notified 87,000 customers that their power would be cut starting Sunday night after the National Weather Service warned of extreme fire danger throughout the region. Most of the affected customers are in the Sierra Nevada foothills about 50 miles (80 kilometers) east of Sacramento. Winds strong enough to down power lines have brought a renewed threat of fire just months after wildfires devastated the north. Winds that prompted California utilities to cut power in a precautionary move to prevent wildfires have decreased in strength but fire warnings remain in effect in southeastern and northeastern parts of the state. The National Weather Service said in a statement that fire danger warnings will continue in effect through Tuesday evening from counties northwest of Los Angeles southward through the interior of San Diego County to the U.S.-Mexico border. Gusty winds in the region are expected to gradually diminish in the afternoon but warm, dry and breezy conditions will persist through the week. In the upper half of the state, fire weather warnings have been narrowed to the northern Sierra Nevada. Meteorologists say gusts early Tuesday in hills of the San Francisco Bay region reached speeds of 20-30 mph (32-48 kph) after 50-70 mph (80-113 kph) gusts were recorded Monday. Utilities continue to report progress in restoring power. 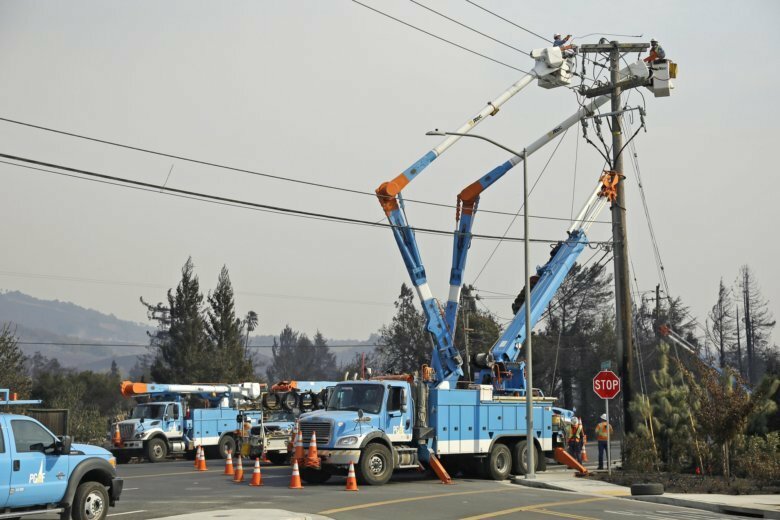 California utilities are restoring electricity after intentionally cutting it to tens of thousands of people because of extreme fire danger but high winds expected to sweep the area could see more outages. Winds strong enough to down power lines have brought a renewed threat of fire scant months after wildfires devastated the north. In Northern California, Pacific Gas & Electric company cut power to about 60,000 people beginning Sunday night as a safety measure. The utility expects to have it restored for everyone Tuesday. However, gusty winds of up to 50 mph are expected to linger east and north of Sacramento. Southern California Edison and San Diego Gas & Electric both say there’s a continued chance of outages, either from the wind or as a safety measure.